Namaste! Welcome to Ruchkar Mejwani with Archana. I am going to show you a different Chicken Biryani recipe, Reshmi Chicken Biryani. This biryani is made using mutton as well. We are making chicken biryani..
..and, people make it in different ways. But, I am going to show you a simplest way. ..we have taken 3\4 kg chicken. I have taken chicken with bone. You can use boneless. We have taken 2 tbsp ginger, garlic and green chilli paste. And I have taken 100 gm curd. We are taking mint leaves. Add few now and save some for later. And we have taken 1 cup. thick coconut milk. And, salt as per taste. Lets mix it nicely. And, now we have to keep it as it is for 30 mins. 30 mins have passed. This is nicely marinated. Now, lets cook this. We are taking 4 tbsp oil. Allow the oil to heat. The oil is hot now. Now, lets take the chicken. We have taken fried onion here. I have fried about 5 onions.. ..I am going to add about 1\2 cup in this. We will need the leftover for rice. Now, lets mix this. Lets cover it with a lid and allow it to cook. Lets check whether the chicken has cooked. The chicken is cooked. And we need to keep some gravy. Now, we are going to add cooked rice in it. On this we will be adding some mint leaves, some coriander and some fried onion. Lets add the fried onions. While making rice or chicken, I haven't used garam masala, it has a mild flavour. Lets add rice again. Lets add all the rice. Let's stead it a bit. And we have taken lemon juice. Lets add it. Again add some mint leaves, coriander leaves. I haven't used whole garam masala in the chicken gravy nor in the rice..
..because, it has a mild flavour. Now, lets cover it with a lid..
..but, before that create some space in this..
..so that, the steam should seep in the rice. Keep the lid on it. Lets wait until the steam occurs. Lets check whether the steam has come. Oh wow! Nice steam has come. Lets switch off the stove. And lets serve it now. Surely, try this recipe. 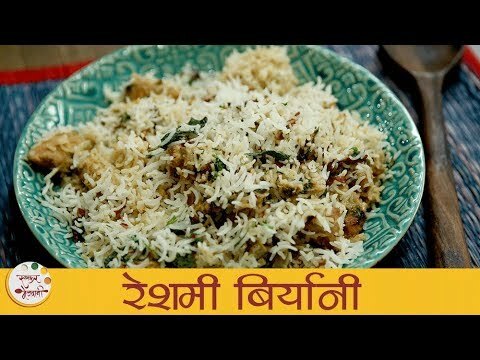 I am going to show you a variety of rice recipes..
..for that, you have to subscribe to Ruchkar Mejwani.